ABBOTTSTOWN, PA 2/25/2017 – Fans saw it all at Lincoln Speedway Saturday. They were greeted with cloudy skies and temperatures exceeding 70 degrees at the outset, cleared the stands when a tornado warning was issued at 2:20 p.m., waited out a four-hour, forty-minute rain and hail storm delay, returned to the stands to a 20-degree temperature drop, and then withstood heavy winds to see Danny Dietrich score his 32nd career win and claim the $4,000 top prize in Saturday “Icebreaker 30” season opener for 410 sprint cars. A redraw placed Dietrich sixth for the start. A second lap yellow for eighth-starting Bradley Howard, who came to a stop in turn three was the only caution of the event. At the time, Jim Siegel dropped into the pits and did not return. Dietrich was running fifth when polesitter and race-long leader Tim Glatfelter hit lapped traffic on lap six. Five laps later, fifth-starting Brian Montieth took the lead from Glatfelter on the backstretch, only to slow suddenly three laps later with mechanical issues, turning the lead back over to Glatfelter. Dietrich inherited fourth when Montieth dropped from the field, behind Glatfelter, front row starter Campbell, and Kyle Moody. Dietrich caught Moody for third on lap 17 and passed both Campbell for second and Glatfelter on the back stretch of lap 20. From there, he checked out on the field until developing motor problems of his own with just a few laps to go. He was able to nurse it home and cross 297 seconds ahead of runner-up Moody at the finish. Crossing third through fifth behind Dietrich and Moody were Cory Haas in new Trone Outdoor Advertising #39 ride, 11th-starting Gerard McIntyre, Jr., and Freddie Rahmer. Sixth through tenth were Campbell, 26th-starting and hard-charger Chase Dietz, Chad Trout, Shane Hoff, and 16th-starting Billy Dietrich. All told, there were four lead changes among three drivers over the 30 laps. Heats for the 27 410 Sprints were won by McIntyre, Moody, and Trout. 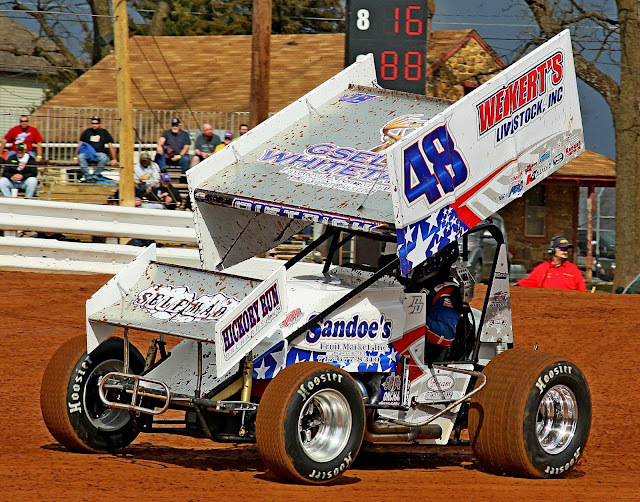 The temperature dropped from 71 degrees during warm-ups to 46 degrees when the “Icebreaker” ended at 7:48 p.m.
Next Saturday, March 4th, Lincoln Speedway returns with another single-division 410 sprint car show. Gates open at noon, with qualifying to begin at 2:00 p.m.
© Copyright 2016 by Sel-Wil, Inc.
My Random Thoughts during an off season !!! !